Typical breakfast pastries are filled with cream cheese but why not one with real cheese? Not only real cheese but cheese from the Island of Menorca! Mahon-Menorca cheese comes from the Island of Menorca, and Mahon, the port on the island. Cattle graze freely on family-owned farms on this island. Menorca has actually been named by UNESCO as a Bioshpere Reserve. Biosphere reserves are areas comprising terrestrial, marine, and coastal ecosystems. Cheese production on this island dates back to 3000 BC! I had never heard of Mahon-Menorca cheese before but it is actually readily available in many stores such as Whole Foods, Costco and Kroger. Other retailers that carry it in the United States include Fairway Markets, Harris Teeter, Saveway, Murray’s Central Markets, Gourmet Garage, West Side Markets, Zabar’s, Central and Town and Country Markets. While I used the Tender variety, any of their cheeses would work for this recipe, providing a rich, salty contrast to the sweet apple butter! I like cheese in pretty much any form and often recommend it to cancer patients and when speaking to support groups. High in protein, calcium and full of flavor, cheese can be added to dishes or enjoyed on its own as a healthy snack. 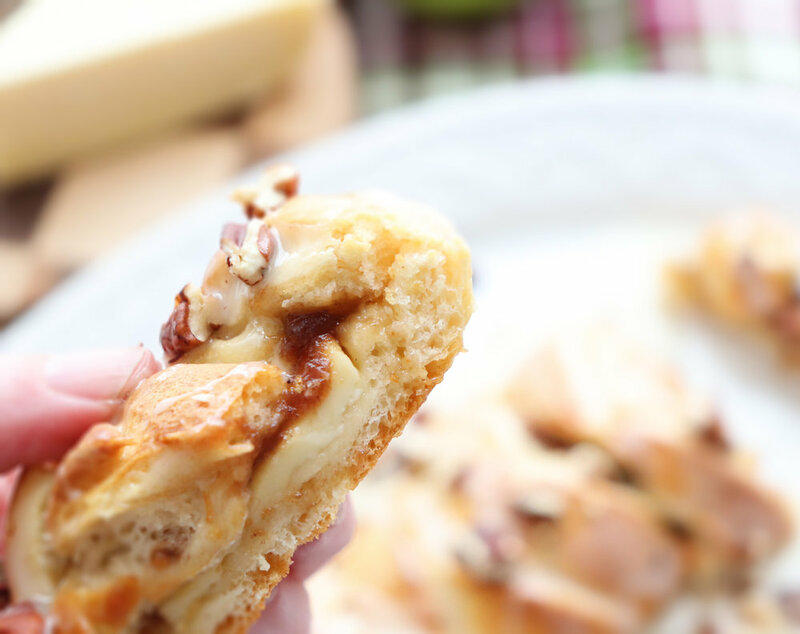 For this recipe, I decided to combine cheese and apple butter in a simple but delicious pastry. Feel free to use store-bought apple butter or make a batch of Slow Cooker Apple Butter with Chia. Making the braid is actually very easy. Simply spread out the dough, cut pieces about one inch apart and 2 inches wide down the length of the dough. Place slices of cheese down the middle, cover with apple butter and then fold over the strips of dough in a diagonal pattern, alternating sides as you go. 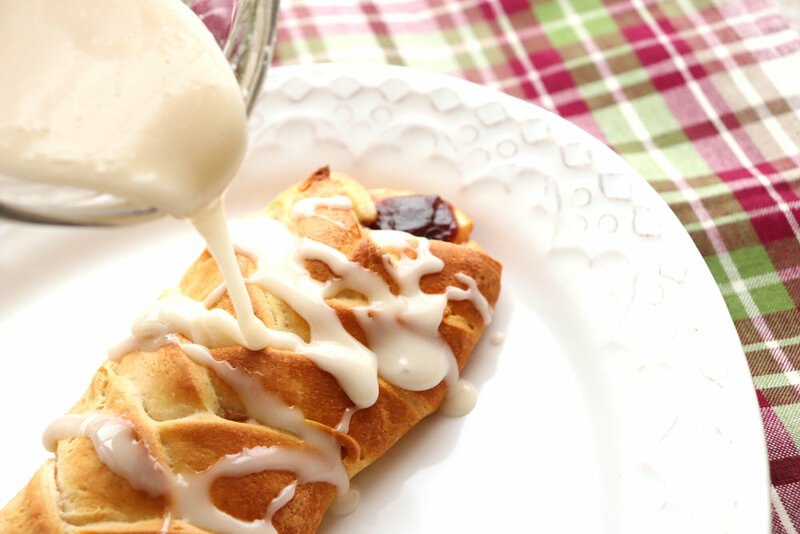 After it bakes, a simple glaze of powdered sugar, honey, vanilla and a splash of milk is drizzled over the top. Sprinkle on some toasted pecans and it is ready to devour! The slightly salty, buttery cheese and the sweet apple butter are a perfect pair! Unroll crescent dough sheet onto parchment paper. Cut the dough in 2 inch strips about 1 inch apart down the length of the dough on each side. Leave about 2 inches in the middle of the dough uncut. Lay slices of cheese down the center of the dough. Spoon apple butter on top of cheese. 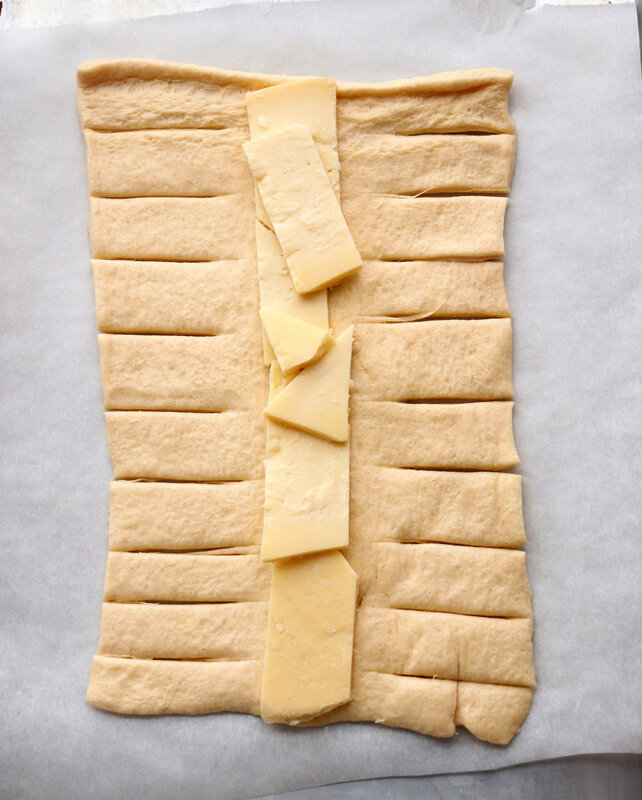 Fold the strips of dough over the mixture in an alternating pattern, forming a braid. Bake 12-14 minutes or until golden brown. Cool 5 minutes on cookie sheet; remove to serving plate. In a small bowl, mix the powdered sugar with honey, vanilla and milk to desired drizzling consistency. 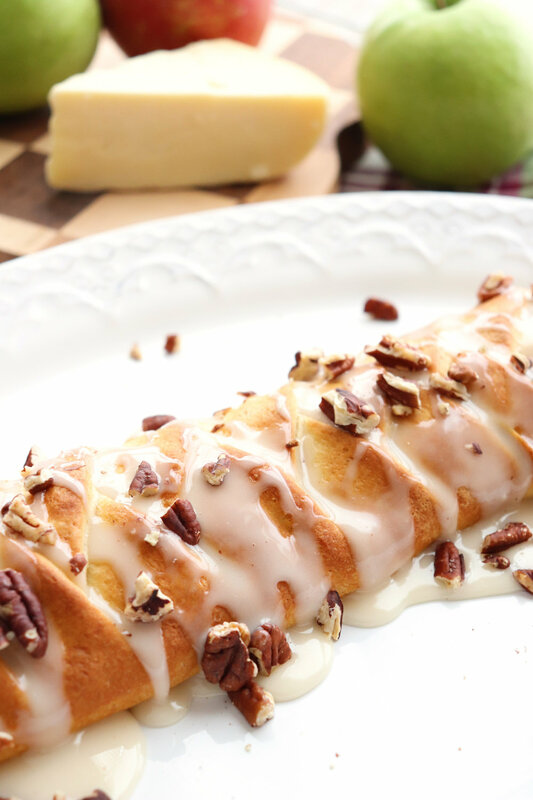 Drizzle glaze over braid and sprinkle with chopped pecans. Serve warm. Follow Mahon-Menorca cheese on Facebook, Twitter and Instagram.